The three top religious leaders of the Central African Republic have been awarded a prize for their efforts for peace in the war-torn Central African Republic. Rev. 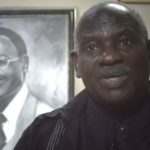 Nicolas Guérékoyamé-Gbangou, 55, President of the Evangelical Alliance; Imam Oumar Kobine Layama, 53, President of the Islamic Community; and Mgr. 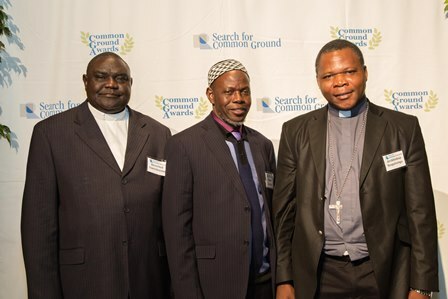 Dieudonné Nzapalainga, 46, the Archbishop of Bangui, were among the five recipients distinguished by Search For Common Ground (SFCG) at a Nov. 13 ceremony in Washington, D.C.. 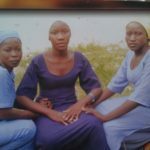 In the midst of the country’s two years of violence, often portrayed as confessional conflict, the three clerics formed a joint platform to promote peaceful coexistence between Christians and Muslims. Their message: Violence in CAR is not primarily caused by religious conflict; instead, the root of the conflict lies in the struggle for political power. The Prize honours the Central African Republic and the builders of peace, Nzapalainga said in his acceptance speech. ”For many years, Muslims and Christians lived in harmony and in the respect of each other’s beliefs. When politicians wanted to use the religion fibres to divide the people, whether to maintain power or to conquer it, we stood up as if we are a single man to say ‘no’ to this war and ‘yes’ to peace”. This view is re-asserted by Imam Layama, who said the award is an encouragement in favour of peace, not only in the CAR, but for the world. ”It is a force to promote peace, justice and equity among men, and a weapon to combat all forms of religious extremism which politicians use to exploit our religions. Let us unite so that justice and peace come together”. The three clerics travelled across the country, visiting areas plagued by violence, to facilitate dialogue among Christian and Muslim community members and hold community meetings to rebuild trust. They toured also European capitals – Rome, Brussels, Paris, London, and Amsterdam – to plead the cause of their country. They met with world leaders like Pope Francois in Vatican and UN General Secretary Ban Ki-moon, at New York. The diplomatic groundwork led to the deployment of UN peacekeepers to CAR in September. 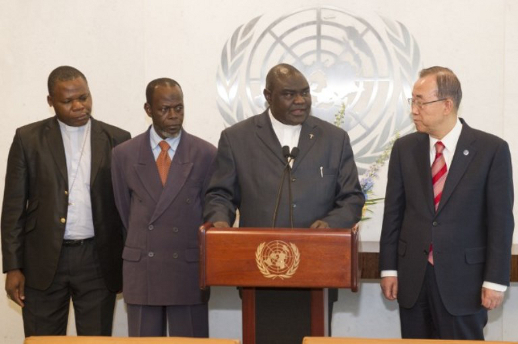 L to R: Archbishop Dieudonné Nzapalainga; Imam Omar Kobine Layama; Rev. Nicolas Guérékoyamé Gbangou; UN Secretary-General Ban Ki-moon, in a photo taken March 13 at the United Nations in New York. This commitment for peace doesn’t come without a price. Guerekoyame was absent, traveling in Europe in January, when his ill daughter died. In August 2013, Rev. Guerekoyame was arrested following comments about the government, in a sermon. Despite being a Member of the National Transitional Council (NTC), an acting parliament set up after the 2012 military coup, which granted him immunity, he was put into prison. In response, Nzapalainga gave himself up to the prison authorities as an act of solidarity. ”I went to prison and asked for a sleeping mat so that I can stay with Rev Nicolas. 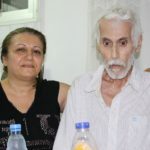 Whatever the time it will last: 3 days, or months, I was determined to remain in prison with him,” the archbishop told World Watch Monitor. Guerekoyame was released after the intervention of the Minister of the Interior. The commitment of the three clerics was also marked by other dramatic episodes, Mgr. Nzapalainga recalled. The December 2013 eruption of violence which followed the offensive of Anti-balaka militiamen in Bangui forced Imam Layama to leave his home and seek refuge at Parish St. Paul. ”When the life of a brother is threatened, we must provide him assistance,” Nzapalainga said. “For more than five months, we welcomed Imam Layama and his family in our midst. This brought us closer a lot. We shared meals and discussed on how to find solutions to the crisis in CAR”. ”In February 2014, we went, the Imam and I, to meet with pastors, priests and imams, gathered within the compound of St. Jacques Parish in Bangui, to convey the message of reconciliation and peace. But when we arrived, we learned that the driver of an imam seemed to be a former Séléka fighter, and suddenly, an angry crowd came to us, wanting to kill him. But we refused to give the man to the crowd, despite the rising tension. Violence in CAR has claimed the lives of several clerics. In October 12, a Polish priest has been abducted by armed men in the extreme west of the country close to Cameroon. Rev. 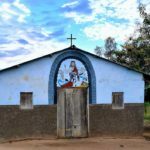 Mateusz Dziedzic of the diocese of Tarnow, in Baboua was abducted by members of a rebel group called the Democratic Front of the Central African People (FDPC). The kidnappers demanded the release of their leader imprisoned in Cameroon, in exchange for Dziedzic. The SFCG prize is not the first of its kind to honor the contribution of clerics for peace in CAR. In September, Human Rights Watch honored Rev. Bernard Kinvi, who saved the lives of hundreds of besieged Muslims, whom he sheltered in the Catholic Church. 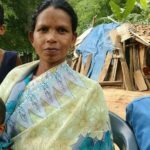 He received the Alison Des Forges Award, which celebrates the valor of individuals who put their lives on the line to protect the dignity and rights of others. Rev. Aurelio Gazzera participated in mediation efforts that helped bring stability in Bozoum, in the northwest of the country. In June, he took part in the Oslo Forum, one of the highest-level meetings of peace mediators, in Norway. At a panel discussion with the President of the Central African Republic, Catherine Samba-Panza, he also reported on his experience with mediation.